The climate is subtropical and hot, but cooled by sea breezes, with a rainy season in June-October, when hurricanes may occur. Rainfall is heavy, especially in mountain areas. 72,000 (2012); 67 per cent of people live in urban areas. The population did not grow between the years of 1990 and 2012, due mainly to the emigration of young people. In 2012 the birth rate was 16 per 1,000 people (est. 26 in 1970) and life expectancy was 76 years (est). 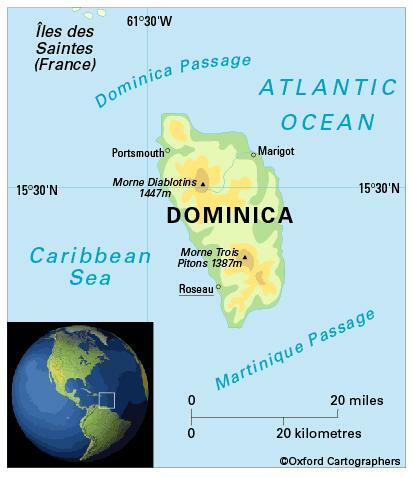 Dominica is classified as an upper-middle-income economy by the World Bank.